The Brewster Buffalo is the only really successful aircraft produced by this company. It is an aircraft that provides a considerable amount of discussion when the topic is brought up. Designed to be the US Navy's first monoplane ship-board fighter, it was all metal construction and had every modern trait; retractable landing gear, fully enclosed cockpit and a robust construction required for ship-board use. It's competitor, the F4F, just wasn't 'ready for prime time' so Brewster won a contract for the F2A-1. From the time of testing until production got underway, several changes were made, including some additional streamlining, and most important, a change over to the Wright R1820 'Cyclone' engine. At first the plan was to use the 1820-22 at 950 hp, but by the time the first of 54 planes started rolling off the production line, the 1820-34 at about 1,050 hp was installed. Later a 1,200 hp 1820-44 was installed. This required a different cowling and the shortening of the overall length by 5 inches to maintain proper center of gravity and resulted in the F2A-2. The first F2A-1 was accepted by the Navy in June 1938, but thanks to Brewster's inadequate production facilities, aircraft only trickled in. By mid December 1939, only 11 aircraft had been accepted and these equipped VF-3 aboard the USS Saratoga, making it the US Navy's first monoplane fighter squadron. Further deliveries of the F2A-1 were interrupted by diverting production to Finland, but that is another story. 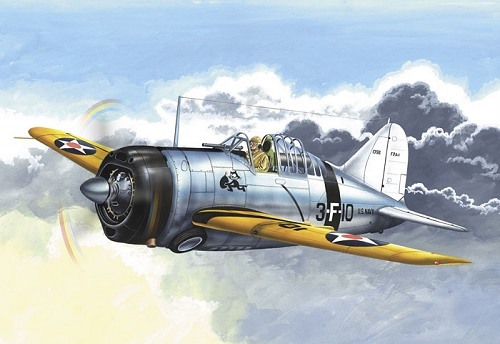 The F2A-1 in Navy service was updated with .50 calibre machine guns in early 1940 and thanks to the additional weight, VF-3 started having landing gear problems. In October 1940, the Saratoga's air group participated in the Barclay camouflage experiments, and then started replacing their F2A-1s with F2A-2s. The older planes were returned to Brewster where eight were remanufactured to -2 standards and later reissued to VS-201, flying off the USS Long Island. By mid-1941, only a single example of the F2A-1 remained and it soldiered on until 1944 in a training squadron. Looking very much like a modern MPM kit, this one consists of three sprues of very nicely done engraved panel line plastic, one sprue of equally nice clear plastic, a small bag of resin parts, a photo etch fret (looks like Eduard), and an excellent decal sheet. Other photo etch bits include brake lines as well as a multitude of interior bits. A photo acetate sheet is provided for instruments on the panel and consoles. Resin is kept to a minimum on this kit and is only used for the engine accessory section and for the ribs on the upper wheel wells. Aside from the bombs and shackles, there are no other optional pieces. As this kit is identical to the Finnish boxing, there are a few bits that are not used. The transparencies are nice and thin so there should be no problems displaying the canopy in the open position. Instructions are really quite good and apply specifically to the F2A-1 version kitted. 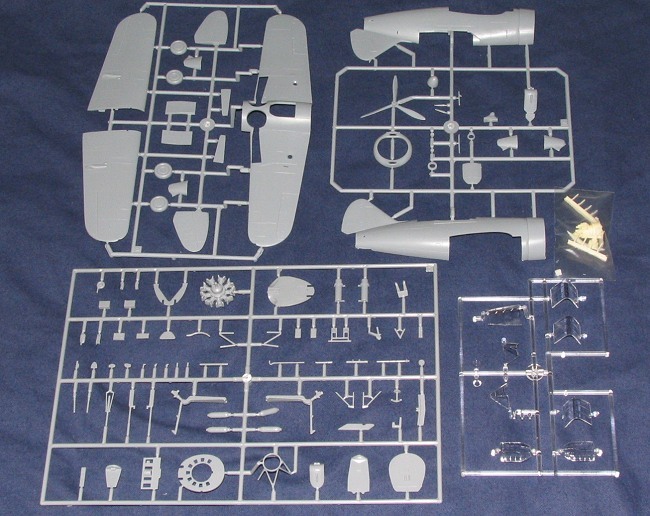 Color information is given in generic names and applies to the basic interior construction of the kit. Each of the construction drawings are well done and it doesn't seem that there will be any ambiguity problems. Small additional drawings and notes are included throughout the construction process. 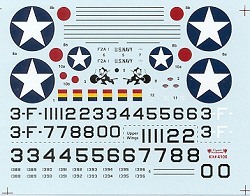 Markings are provided for basically every aircraft assigned to VF-3. All are aluminum fuselage with white fins/stabilizers and yellow wings. The wing and fuselage bands are not provided, but the black trim for them is. One other scheme, a rather generic looking overall FS 36440 light gull grey painted aircraft is given as another option. The Classic Airframes website provides color versions of the painting and marking guide. Decals are superbly done and though no printer is shown, they look like Microscale. Looks like a real winner to me. The overall level of detail is excellent and these kits just seem to be getting better and better. What's more, the subject is such that it will appeal to lots of modelers as 'yellow wing' aircraft are a favorite. No need for conversion kits for the old Tamiya F2A-2, and what's more this one should make into a much more detailed model. Look for a full build review soon. If you would like your product reviewed fairly and fairly quickly by asite that has nearly 300,000 visitors a month, please contactme or see other details in the Note toContributors.